Explore, discover, and learn year round with endless events in Madison. From free fun to food festivities, you’ll find what you’re looking for. Long to live the lake life? Love local libations? Interested in inspiration? Maybe an immersive experience with exclusive access to some of Madison’s favorite attractions is what you seek. Madison’s exceptional event scene has you covered. We’ve even got itineraries to get you started on your Madison adventure. Want your special event to show on our calendar? Read our guidelines and use our event submission form. Looking for the best offers from some of the area’s best establishments? Head to the Special Offers page to see if there&apos;s a deal worth snagging. 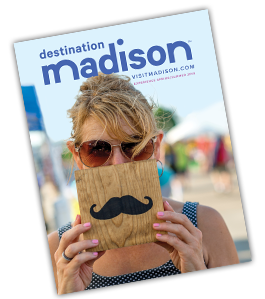 We invite Destination Madison Partners to submit their events for inclusion on our calendar. If you are not yet a partner and want to know more, contact partnership@visitmadison.com.